to facilitate technology providers for Asian market penetration, softlanding and success. Our professional team has comprehensive expertise including water/wastewater treatment, soil/groundwater remediation, air pollution control, solid waste management/recycling, and environmental monitoring. ALCLE provides quality services to our clients to form market intelligence, identify niche market, tailor market entry strategy, perform business development, locate reliable partners, build sales channels as well as provide marketing and project support. In China, ALCLE has a wide network and established formal collaboration with government agencies, public companies, technology transfer platforms, engineering firms, investment groups, and research institutions/universities. 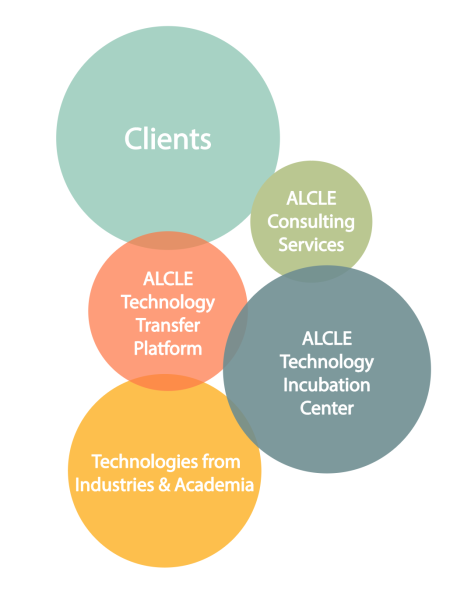 With in-depth understanding of cleantech industry, strong market research capabilities and comprehensive network, ALCLE has established a database covering various environmental fields with more than 1000+ innovative technologies and 500+ actual needs. Powered by AI, this dynamic database will assist ALCLE to provide intelligent data-driven consultancy and strategy delineation for our clients.